In a 1972 poll of sixty-seven AI and computer science experts, respondents were roughly divided between expecting human-level intelligence in 20 years, in 50 years and in more than 50 years. They were also roughly divided between considering a ‘takeover’ by AI a negligible and a substantial risk – with ‘overwhelming risk’ far less popular. 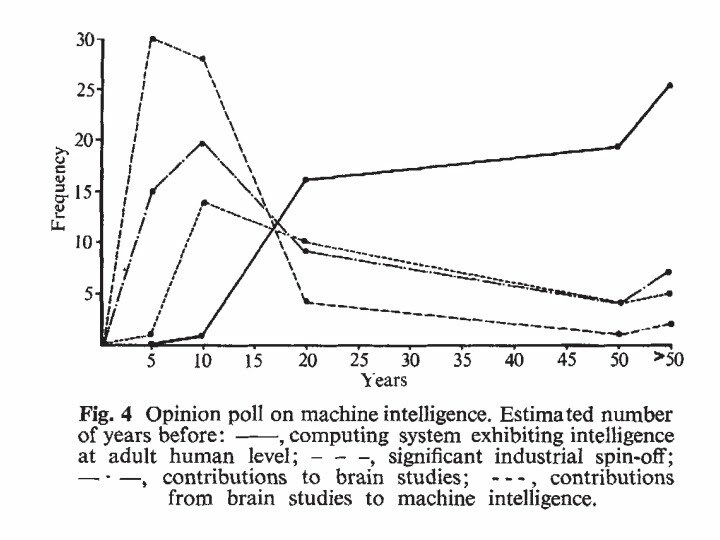 Donald Michie reported on the poll in Machines and the Theory of Intelligence (pdf download). The participants were sixty-seven British and American computer scientists working in or close to machine intelligence. The paper does not say much more about the methodology used. It is unclear whether Michie ran the poll. Almost all participants predicted human level computing systems would not emerge for over twenty years. They were roughly divided between 20, 50, and more. See figure 4 below (from p512). Figure 2: Firschein and Coles 1973 present this table, which appears to report on the same survey.